I love anything that brings mythology into the modern world. And Carter has accomplished this beautifully. 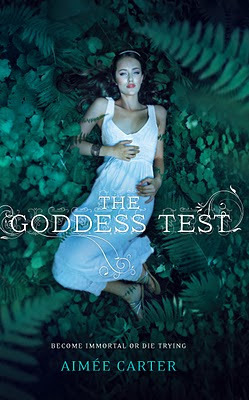 I never doubted that the Greek god Hades was looking for a new queen. It made perfect sense and the mythological world was seamlessly tied into Kate's world. Appropriately fantastical, just realistic enough. This is a fun and really well done first novel. I'm impressed with how believable it all was, and that I was sad when the story ended--not that the ending wasn't happy, but that, sigh, it was over (until February). The characters are strong, all of them. These aren't thin developments, you know the characters and their personalities. There's minimal teen angst, which is good. Not every book needs to be angsty, and this book wouldn't be nearly as good if Kate was falling apart. Brianna Karp entered the workforce at age ten, supporting her mother and sister through out her teen years in Southern California. Although her young life was scarred by violence and abuse, Karp stayed focused on her dream of a steady job and a home of her own. By age twenty-two her dream became reality. Karp loved her job as an executive assistant and signed the lease on a tiny cottage near the beach. And then the Great Recession hit. Karp, like millions of others, lost her job. In the six months between the day she was laid off and the day she was forced out onto the street, Karp scrambled for temp work and filed hundreds of job applications, only to find all doors closed. When she inherited a thirty-foot travel trailer after her father’s suicide, Karp parked it in a Walmart parking lot and began to blog about her search for work and a way back. Karp began her journey as a home less person terrified and ashamed. Fear turned to awe as she con nect ed with other homeless people whose remarkable stories inspired her to be come an activist for the homeless community. Deeply compassionate and darkly funny, this unforgettable memoir celebrates the courage and creativity of lives society would otherwise stigmatize. I really can't find the words to describe how much this book amazed me. I've always been one to make assumptions about the lives of homeless people, even though my compassionate and Christian heart kept telling me I didn't know the whole story. We all know that there's a backstory, something we don't understand, but we don't always internalize that knowledge in our dealings with people. This isn't a "fluff" read. It's not a literal guidebook. It's the reality of going from solvency to living day to day in a WalMart parking lot (because WalMart doesn't charge for overnight stays). Karp has shared a no holds barred telling of her daily life. It's gritty. It's dirty. It's unpleasant. And it made me hurt to read it. 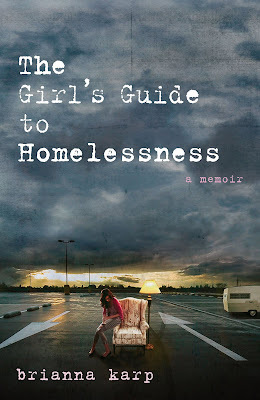 But it's a book that so many, not just those who find themselves suddenly homeless, can relate to. This book isn't about adversity. It isn't about merely surviving in tough economic times. It's about living boldly. It's about thriving because of your circumstances--not letting your circumstances thrive. I've never read a book and thought that everyone should read it. Until this one. NEVER STRAY FROM HALLOWED GROUND. I’ve never broken them…until now. Amelia's father's rules aren't difficult ones. But under these circumstances, it's impossible to have a "normal" life. You can't get too close to anyone, and certainly not anyone being followed by ghosts. And your work as a cemetary restorer and historian can itself put you in some danger. Amelia is an amazing character. She's interesting, she's intellectual, she's inspiring in a way. She's not creepy or spooky by any means, regardless of her line of work or history. She's just....interesting. There's so many dimensions, that I hope to see explored in the upcoming books in the series. Again, the story isn't just in Charleston. Charleston and its history and culture are vital to the story. (Why do so many authors fail to do this? It's not enough to just mention a famous location.) There's twists, and turns, and details you have to have caught or the next few pages make no sense. It's a great start to a series I'm anxiously awaiting the next installment of--November can't get here fast enough! ﻿An unwanted dog. An emotional rescue. Two lives forever changed. Laurie's dreams had been shattered before she came to work at Crystal Peaks Youth Ranch—the ranch of rescued dreams—where broken horses and broken children encounter healing every day. In an attempt to soothe her aching soul, Laurie reached out to save a dog in need. And she soon began to realize that the dog was rescuing her. Abused animals are rescued daily, desperately searching for basic love and care. Rarely do we expect to find that the human rescuer is, in fact, "rescued" by the animal they have saved. It's the same idea as realizing that our "pet" is truly a family member that can never be replaced. Laurie and Mia are a pair that cannot be separated. After rescuing Mia from a home that had so many problems that an under-nourished dog was the mildest of them, Laurie carefully nurses Mia back to health and life. Only as time went on and Mia was faced with new challenges, did Laurie realize that Mia was teaching her about life and nursing her back to emotional and spiritual health. Mia is amazing, teaching not only Laurie but others to trust in your unseen Master, for a loving one never steers you wrong. 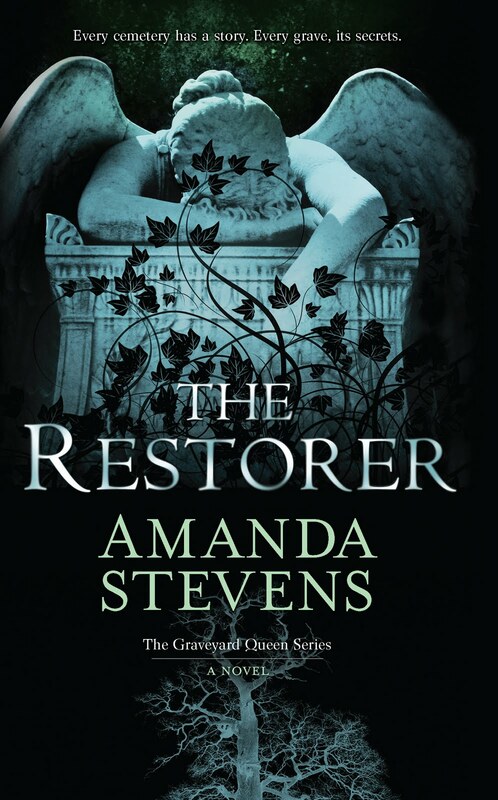 It's a story of a woman in need of rescuing finding her self in God's love as she saves a dog. Acceptance and pure love are at the heart of Laurie and Mia's story. Growing up in the country is never easy, but it sure is funny—especially if you happen to have a sister obsessed with being glamorous, a grandma just discovering make-up, hippie friends who never shower, and brand new neighbors from the city who test everyone’s patience. From disastrous dye jobs to forced apologies and elderly date tagalongs, you’ll laugh ‘til you cry as you read the Confessions of April Grace! In spite of all the loony characters in her life, April Grace is able to learn from her parents as they share the love of God—to even the craziest of characters! Can I just say, I love April Grace? She's no fool. She knows things aren't always as they seem. And she refuses to except nonsense--like the new neighbors who've moved into her dirt road community from glitzy California. She's the girl I would've loved to have been at her age! Resilient and a little mouthy, but with good intentions. The story is fabulous, and full of setting/scenic detail that Ozark Mountain native KD McCrite knows well. 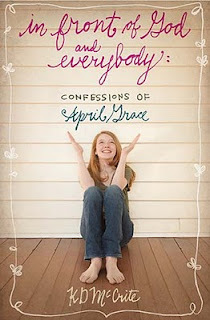 I got lost in this story, easily connecting with April Grace and realizing that I had the same emotional responses to the other characters that she did. (I rarely connect that well with characters, since I don't often "internalize" books.) This is a rare blend of a coming of age story (for April Grace) and facing reality story (for others)--clearly the 2 story lines are intertwined, but it's not April Grace who must face reality. This is McCrite's first book, and I can't wait to see another. McCrite, KD. 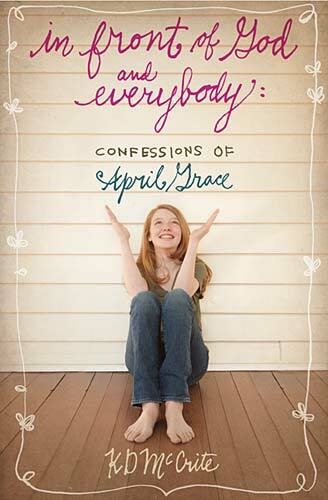 The Confessions of April Grace: In Front of God and Everybody. Thomas Nelson Publishers, May 2011. 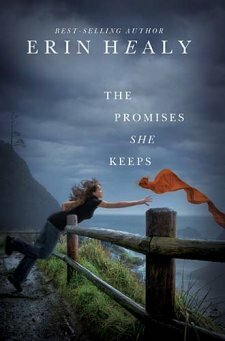 Rather a dark story, Healy's The Promises She Keeps is oddly filled with hope and whimsy. The story reveals the lives of three lead characters, with very different backgrounds and stories. At first, I couldn't determine what the three had in common or why they were even in the same novel. Chase is the example of the basic and simple side of all people--focused and wanting what only makes sense to want. His simpleness is the whimsy in the story (Why shouldn't things be the way he sees them?) Promise is looking for the one thing that her life as it is will never be able to give her. The one thing that her well-meaning and well-off parents can never give her. Promise's story is the hope. And Porta is the painful reality, the one who turns the beautiful into the ugly. It's not an easy read, and you do have to pay attention to what's going on. It's haunting and painful, yet beautiful. It is, quite simply, lovely. A secret government unit is formed under the oversight of Adam Harrison, famed paranormal investigator. The six members he's gathered know a little of the otherworldly—each has honed a psychic talent of their own. Jackson Crow, part English, part Cheyenne, heads the group. Haunted by his experience with an ancestral ghost who saved his life as a child, and the recent murders of two previous teammates, Jackson can't tell if Adam's demoted him or given him an extraordinary opportunity. Despite his link to the realm of spirits, he's well aware that the living commit the most heinous crimes, with spiritualist charlatans existing merely to fool and seduce the unwary. 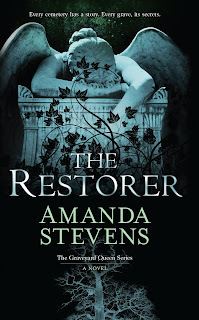 To counterbalance Jackson's careful skepticism, Adam Harrison has paired him with Angela Hawkins, a young woman who learned the painful lesson of loss at an early age. A police officer utilizing her paranormal intuition in Virginia, she already has her hands full. But Adam's call to New Orleans is strong. The case: In a historic mansion in New Orleans' French Quarter, a senator's wife falls to her death from a balcony. Most think she jumped, distraught over the loss of her young son. Some say she was pushed. And yet others believe she was beckoned by the ghostly spirits that inhabit the house—once the site of a serial killer's grisly work. My personal "fluff" reading is paranormal fiction. So, to be able to pick this up in pre-publication was a win for me. The story is interesting and the lead characters (Jackson Crow and Angela Hawkins) are well-developed. It's rare that I find enough believable backstory to bring a character to life. Graham, once again, delivers that wonderful character development I know her for. The story is well-done. 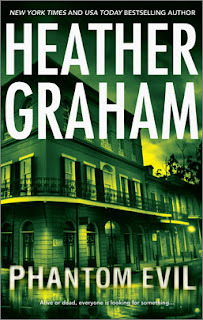 Graham does more than just randomly set her story in New Orleans, she includes New Orleans in the story. There's so much to draw from in New Orleans for paranormal/supernatural stories, but she also does a little history work. Overall, the story is good. However, some of the character stuff bothers me. There's 6 on the team, and 3 involved in the case. That's 9 primary/secondary characters that are through out the story. A bit busy. Also, the romance between Crow and Hawkins. While it's believable that there would be some attraction, it all moves much too quickly. Much, much too quickly. Overall, it's a good story, I just wouldn't give it 4 or 5 stars.